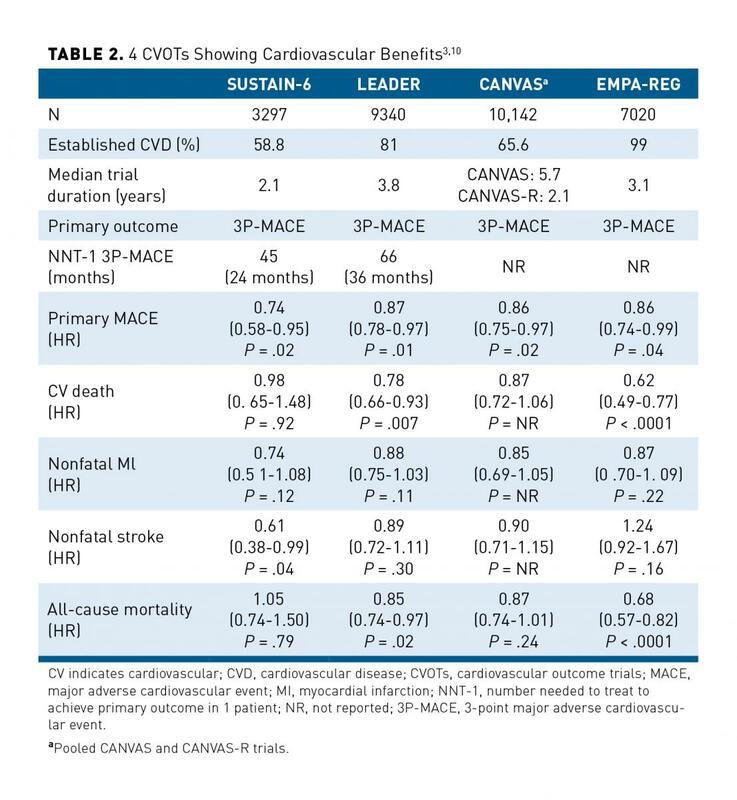 Over the past decade, cardiovascular outcomes trials (CVOTs) have become an integral part of all novel antihyperglycemic drugs developed, with studies seeking, at a minimum, to establish a lack of cardiovascular-related harm and a few even showing cardiovascular-related benefits.1 This educational activity will provide an overview of the agents that have shown cardiovascular-related benefits and recent clinical trial data supporting their efficacy in reducing cardiovascular comorbidities alongside improving glycemic goals in patients with type 2 diabetes (T2D). 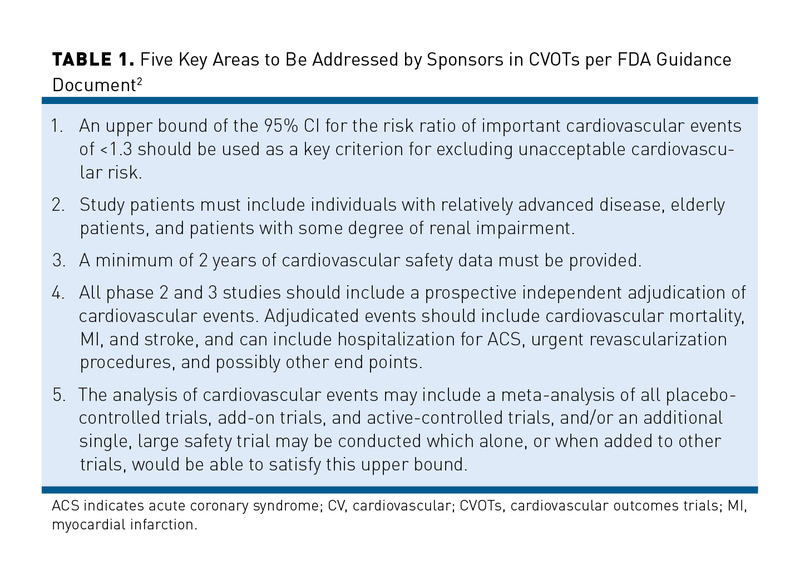 To effectively evaluate cardiovascular benefits while ensuring that sample size and duration of follow-up remain reasonable, CVOTs require the use of composite end points comprised of major adverse cardiovascular events (MACEs), as explained in item 4 of Table 1.2 The most common of these is the 3-point composite of major adverse cardiovascular event (3P-MACE), which can include cardiovascular death, nonfatal myocardial infarction (MI), and nonfatal stroke, although some studies add hospitalization for unstable angina (HUA) to the 3P-MACE (4P-MACE).2 However, the use of 4P-MACE is generally discouraged in the medical literature due to the subjectivity in ascertainment of HUA, lower prognostic relevance, and recent CVOTs indicating that antihyperglycemic agents have minimal impact on HUA.2 Because many CVOTs are noninferiority trials, using a 4P-MACE instead of 3P-MACE may shift the hazard ratio (HR) toward the null, which may be problematic.2 Therefore, most (but not all) trials will use a 3P-MACE to meet the safety standards. Two primary classes of antihyperglycemic agents, sodium-glucose cotransporter 2 (SGLT2) inhibitors and glucagon-like peptide-1 receptor agonists (GLP-1 RAs), have been shown to have beneficial cardiovascular effects on patients with T2D.3 Pertinent information, including clinical trial data and mechanisms of action of cardiovascular disease (CVD) risk reduction, for agents that have shown benefit are reviewed in the following pages. 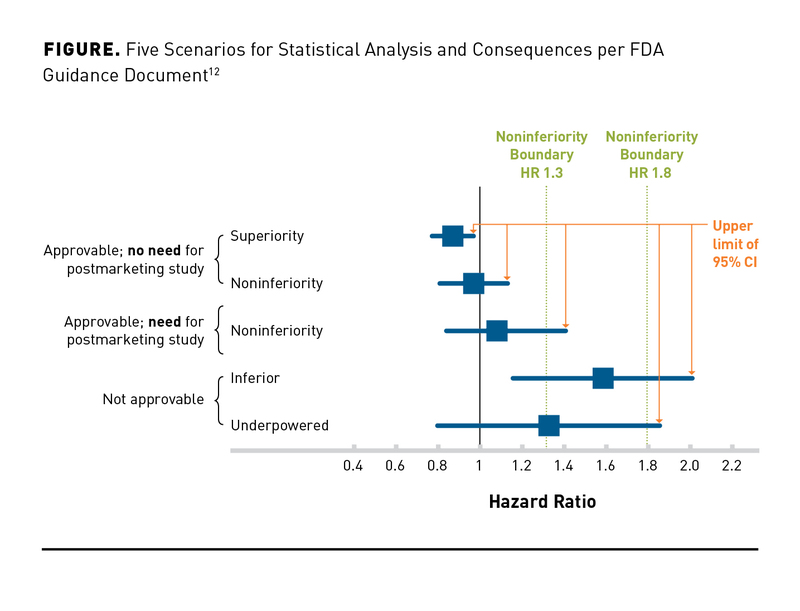 Although healthcare providers must bear in mind specific warnings and precautions that may discourage a particular agent’s use, the guidelines do not make any specific recommendations between SGLT2 inhibitors and GLP-1 RAs.20 To evaluate comparative efficacy between these agents and dipeptidyl-peptidase-4 (DPP-4) inhibitors against either placebo or no treatment, Zheng et al conducted a meta-analysis using mortality and cardiovascular end points.32 The meta-analysis covered 236 trials for a total of 176,310 patients, with a primary outcome of all-cause mortality and secondary outcomes that included CVD mortality, HF, MI, unstable angina, stroke, and safety end points (AEs and hypoglycemia).32 Researchers found that SGLT2 inhibitors (HR, 0.80; 95% CI, 0.71-0.89) and GLP-1 RAs (HR, 0.88; 95% CI, 0.81-0.94), but not DPP-4 inhibitors (HR, 1.02; 95% CI, 0.94-1.11), were associated with significantly reduced all-cause mortality in patients with T2D.32 Additionally, SGLT2 inhibitors were associated with significantly lower rates of cardiovascular mortality (HR, 0.79; 95% CI, 0.69-0.91), HF events (HR, 0.62; 95% CI, 0.54-0.72), and MI (HR, 0.86; 95% CI, 0.77-0.97); GLP-1 RAs were associated with lower rates of cardiovascular mortality (HR, 0.85; 95% CI, 0.77-0.94) but increased risk of AEs leading to study discontinuation (vs SGLT2 inhibitors, HR, 1.80; 95% CI, 1.44-2.25; vs DPP-4 inhibitors, HR 1.93; 95% CI, 1.59-2.35).32 These results indicate that either SGLT2 inhibitors or GLP-1 RAs would be effective at improving mortality outcomes among patients with T2D; however, SGLT2 inhibitors may yield fewer AEs and therefore be better tolerated by patients.